Cider vinegar and apple cider vinegar are by and large the same product. Cider vinegar is usually made from apples. However, cider vinegar can also be made from other fruits; for instance, raspberries, in which case it is called raspberry cider vinegar. Cider vinegar is usually made by fermenting apple or other fruit juice using a substance called "Mother of Vinegar," which contains bacteria. The bacteria break down the sugars in the juice to acetic acid and malic acid, resulting in the sour-flavored vinegar. The process for making apple cider vinegar is the same as for any cider vinegar. Bacteria are added to the juice; this breaks down the naturally occurring fruit sugar, fructose, into alcohol. The alcohol then undergoes another conversion into acetic acid and malic acid. The longer the bacteria sit in the barrel or bottle, the more acidic the vinegar. The acidity of cider vinegar and apple cider vinegar is very high. In fact, apple cider vinegar has been rumored to burn the throat when consumed in large, concentrated tablets. The acidity of these vinegars makes them a popular ingredient in salad dressings, marinades and anywhere else a strong, tangy flavor is desired. Cider vinegar and apple cider vinegar have equivalent benefits to offer. Using flavored vinegars such as apple cider vinegar is a good way to avoid sodium without compromising flavor. Apple cider vinegar has the same bite as vinegar, with an interesting fruity touch. Like all vinegars, cider vinegar has no calories, no sodium and no preservatives. The omnipresence of cider vinegar in supermarkets across the country has helped work it into many recipes available online for stir fry, sauces, dressings and marinades. 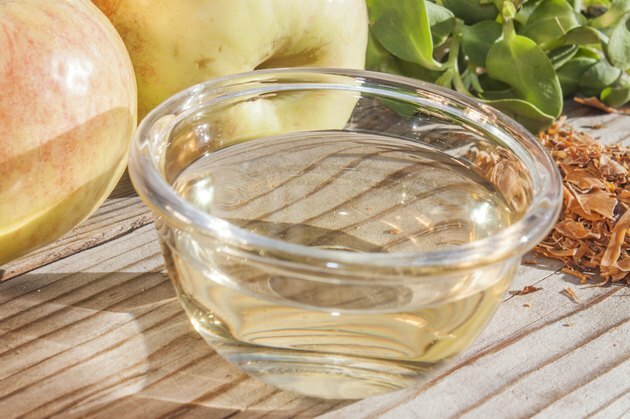 Apple cider vinegar has a strong acid profile with a noticeable apple essence. The point of using flavored vinegars is to add depth to foods. Cold vinegar has the strongest flavor, whereas heated vinegar has a lighter touch.